Sierra Wireless MC8775 no sound? Thank Zender, I flashed BIOS and loaded HP 2300 HSDPA PCI-E mini card (MC8775). Also I activated voice function through dc-unlocker. Eeverything seems ok except that there is no sound when dial out and recieve calls. Does anybody know how to get sounds? I think MC8775 has no mic and earphone port which is different with AC875 or AC860, thus the voice part must work with audio software or hardware support of Thinkpads. I asked for techinial support of Sierra Wireless, they just replied that it is out their businees and push me to Lenovo. Should I email Lenovo? Other notebook manufacturers such as ASUS and Dialogue flybook's, use their version of the Sierra Wireless MC8775v to perform fully functioning voice calls with vendor specific software on their selected notebooks etc. I do not think Lenovo will be able to help as their MC8775's (as far as I know) are not Voice enabled. I do hope that there is a solution out there to get the MC8775 voice enabled version to interface with ThinkPads! for voice calls - I will keep looking and if successful post it here. Have you tried installing the proprietary software from other notebook brand? There was some weird behaviour of MC8775V (factory-enabled voice, sold with the "V" at the end) in X300 - the card simply shut itself off, no matter what was done. And yet it worked perfectly fine in USB enclosure (that is disassembling 875U USB modem, removing regular MC8775 and putting the MC8775V inside). Also Sierra Wireless' website seems to indirectly state, that the MC8775V (as opposed to MC8775) does not adhere to miniPCIe specs. Zender wrote: Have you tried installing the proprietary software from other notebook brand? YES - Unfortunately the ASUS Wireless Console Utility which according to their website is required (before the installation of their MC8775V ASUS driver & watcher software) is vendor specific to themselves with an additional driver (ata0100) required, which I can not find. The Dialogue Flybook website does not seem to have any WWAN driver's to download for any of their notebooks! Has anyone tried the generic Sierra Wireless software (3G Watcher)? If not, please do and tell us whether it works! I do not have a card to try this on (X61 with MC8775 on the way), but I ran the installer to check it out, and it does manage the voice features of 3G cards also. I also tried FlyBook Utility, but it doesn't work with SW MC8775(v) in X300. Also I emailed technical support of SW and they just said it is kind of out of their business and kicked me to Lenovo. But I don't think Lenovo will help us with this. Well, I also thought about the same question: why only PCI-E mini card doesn't work while USB or PC port card such as AirCard 875 can easily make voice calls? I believe there must lacks some software surpport. The software alert vocies of 3G watcher are all ok, including data connection, SMS. It just like some dll files does not exist which let 3G watcher use audio hardward of X300. bananaman wrote: Has anyone tried the generic Sierra Wireless software (3G Watcher)? If not, please do and tell us whether it works! It works well with data communication, you can dial out and recieve calls if voice is enabled. BUT, there is no audio with all the calls in X300. You may try with X61, I guess it might be the same. Not saying its definate but my X61 can enable voice via the generic 3GWatcher but when I dial a phone it hangs up straight away and I can't do any voice stuff. SMS works as does 3G data. The MC8775V is developed to support inbound / outbound sound for use on a voice network. How this behaves in OEM equipment such as a laptop will be decided by the OEM. It is how they choose to integrate our equipment into their devices. You will need to contact each an OEM to find out specificly if their products has integrated the mc8775V into main system audio/mic, or if it uses an external connector. I'd consider that a bad news. 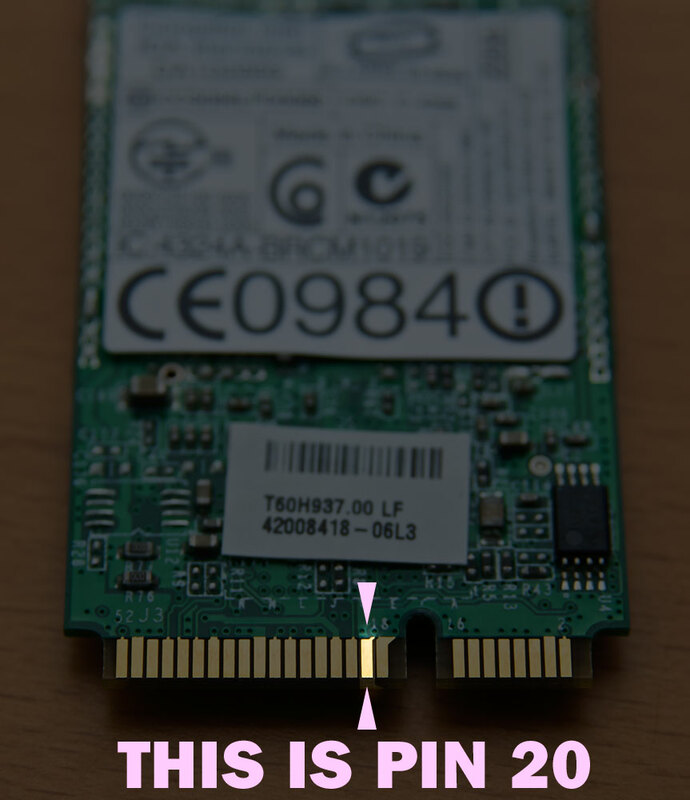 It seems that some pins need to be connected to get audio from them and it can't get it through USB, and that's why it doesn't adhere to miniPCIe spec. However MC8785V should be able to do that (my guess). I tried installing the MC8775V on my X300 with Zender's modified BIOS and I was able to boot up Vista. The problem is the MC8775V will only turn on for about 30 seconds then is powers off. I tried different 3G watcher applications but always the same thing. Does anyone know a way around this? Re: Sierra Wireless MC8775 no sound? garcia916 wrote: I tried installing the MC8775V on my X300 with Zender's modified BIOS and I was able to boot up Vista. The problem is the MC8775V will only turn on for about 30 seconds then is powers off. I tried different 3G watcher applications but always the same thing. Does anyone know a way around this?